My home for the flight, seat 5B. My neighbor’s already watching a movie! Last weekend, I flew from LAX to Auckland to attend the Air New Zealand Wine Awards in Auckland. It might seem odd that an airline’s wine awards are such a big deal, but not in the case of Air New Zealand. 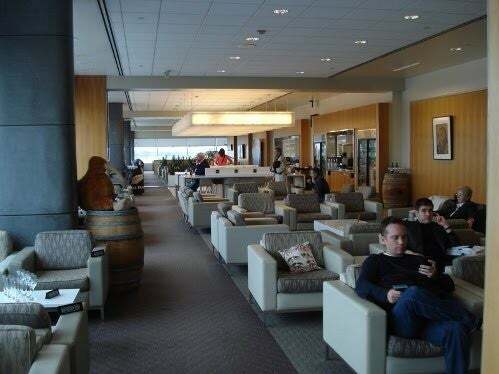 The airline is extraordinarily committed to its wine program—both onboard and in lounges—and these awards are pretty much the biggest event in the country’s wine industry each year. If you’re interested in learning more about them and what I did while I attended the events, leave a comment below and I can write another post describing the experience. 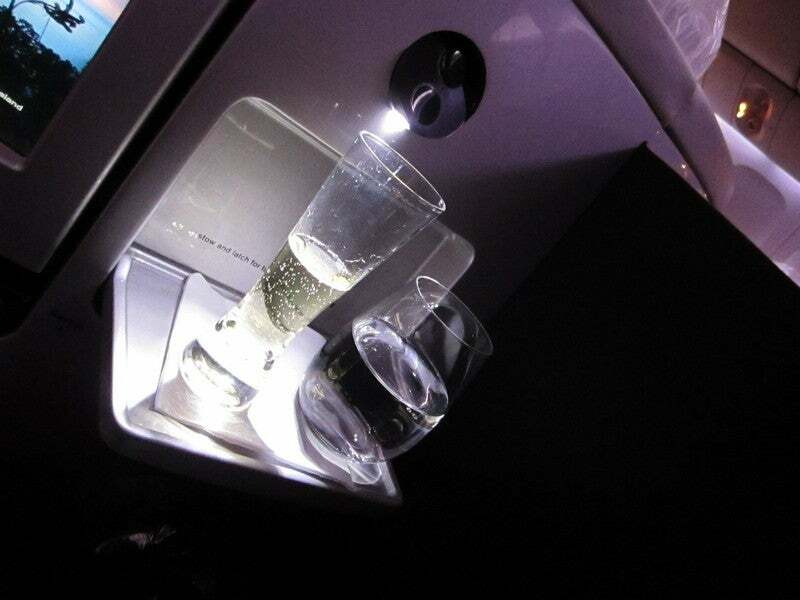 In the meantime, I thought I’d fill you in on my experience flying in the airline’s new Business Premier class aboard one of the new 777-300’s in its fleet. I was a guest of the airline for this trip, but if you wanted to use points you can redeem any Star Alliance miles (for example transfer Chase Ultimate Rewards points to United/Continental and redeem 67,500 miles one way for business class). Award availability on Air New Zealand is scarce, so I recommend using ExpertFlyer to set seat alerts for when those coveted award seats become available. 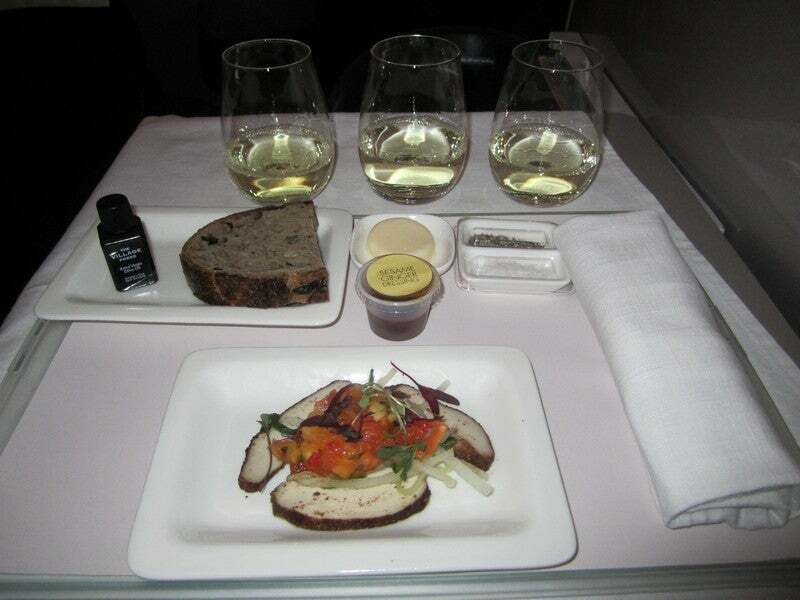 This was actually my second time flying Air New Zealand’s new Business Premier product. The first time was right around Christmas last year when the airline took delivery of the first of the new planes from Boeing. I was invited because I had been covering the new planes and classes of service—including the Premium Economy “spaceseats” and the buzzworthy SkyCouches in economy—for Jaunted for months prior to the delivery. This time, however, was different since the airline now has four of the new planes in service on the Auckland-LAX-London route, and this was an actual commercial flight. It left LAX at 9:15pm, and arrived in Auckland at 7:15 am (we actually left about 30 minutes late due to a Qantas issue on the runway at LAX, but arrived at around 7:35 am, so some of the connecting passengers had to make a dash for it). A shot down the main section of the Koru Lounge at LAX. I got to the airport quite a bit early (thanks, SuperShuttle, sheesh! ), so I spent my extra time waiting in the Air New Zealand Koru Lounge. This is actually my favorite lounge at LAX since it’s pretty spacious, they’ve got great New Zealand wines and beers available (plus sodas and juices), as well as some snacks like cheese and fruit plates. It’s also equipped with a fairly large work area in the back with PCs set up, a children’s play area and six shower suites for the folks making the long-haul from London to Auckland, usually stocked with great organic Pacifica products. Plus, Thierry, the lounge manager, is the consummate host, greeting each guest by name with a hearty handshake, and guiding them toward a table or sitting area. I even heard other passengers talking about how much they loved visiting the lounge just to see him. When it was finally time to board, all was just as I’d remembered. 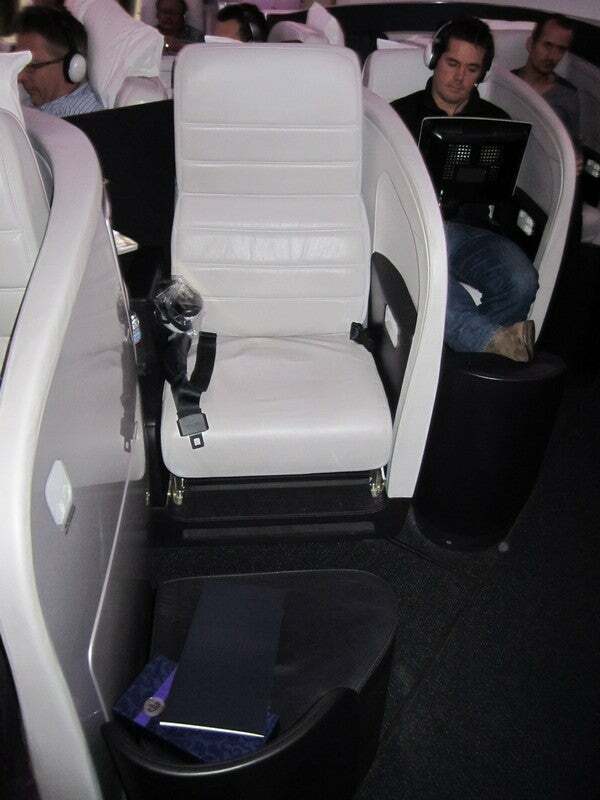 The Business Premier cabins are at the front of the plane and comprise rows 1-12 with a total of 44 seats. It is split into two cabins—7 rows in the front, and 4 rows in the next one, and the seats are configured in a 1-2-1 herringbone pattern. What’s truly different here is the design. These seats are beautifully stitched white leather seats that sort of remind me of a sports car interior, with “ink” (I’d call it sort of charcoal) foot pads that double as a small seat if your companion wants to sit and chat or share a meal with you. When upright, the chair is a fair-sized 22 inches wide, and when reclined—it doesn’t just recline flat like a lazy boy, you actually have to stand up and stow your TV screen and table because the back of it flips over and forward—it stretches to a completely flat 6’7”, so even Brian would fit (barely). Plus, passengers now get a thick mattress pad to put on top of the seat to make it even more cushy, and a medium-sized pillow and lightweight purple duvet. There’s a little cubby under the footrest for storage (I used it for shoes), but most bags have to go in the spacious overhead bins (I had a huge one all to myself), and there are several little cubbies—one underneath the TV monitor, another in one of the armrests, and some empty space beside the seat, to keep your small personal belongings (for me that means a camera and hand sanitizer). The personal television monitor in my seat. 12.1 inches…and tons of movies, tv shows and New Zealand tourism videos. I love a lot of things about the Air New Zealand flight experience—not least of all the friendly crew who are allowed to be themselves, and empowered to engage passengers in a personal and personable way. The airline even has a flight concierge as part of each international crew who can give passengers tips on what to do in each destination. In the Business Premier seats themselves, there’s never a dull moment. 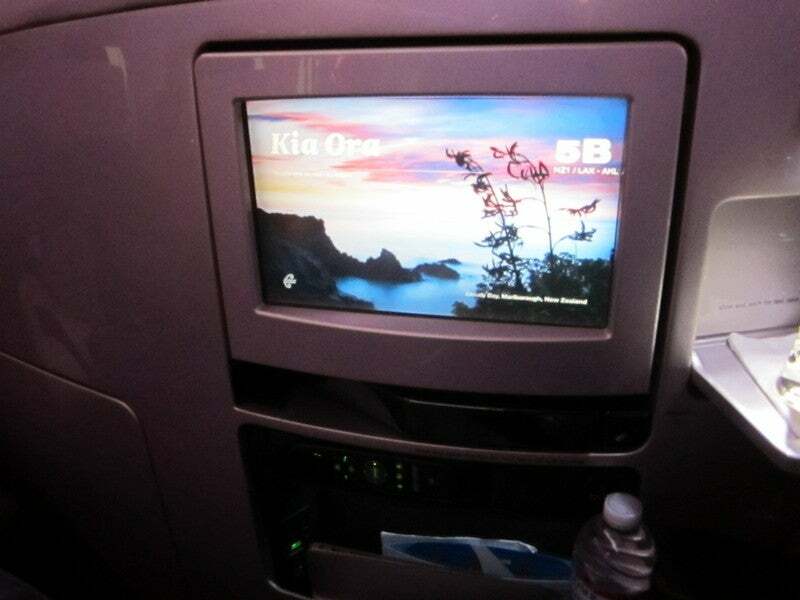 Each has a universal adapter for plugging in your electronics, as well as a 12.1” television monitor and noise-canceling headphones to watch the dozens of movies, television series, and even tourism videos (including several informative 15-minute segments about the country’s various wine regions). The monitor is stowed in the right-hand side wall of the seat, but pops out and is adjustable both horizontally (left-right, front-back) and angle, so if you’re lying down, you can angle it a bit to see the picture properly. The interesting thing here is that the entertainment system is operation while you’re still on the ground, so no waiting an hour until you can watch a movie. You can also use the screen to order food or drinks when you want, track the timeline of the flight and see when meals will be served, how long you have before landing, when the cabin will be dark, etc., so it gives you at least a little more sense of control over your environment. 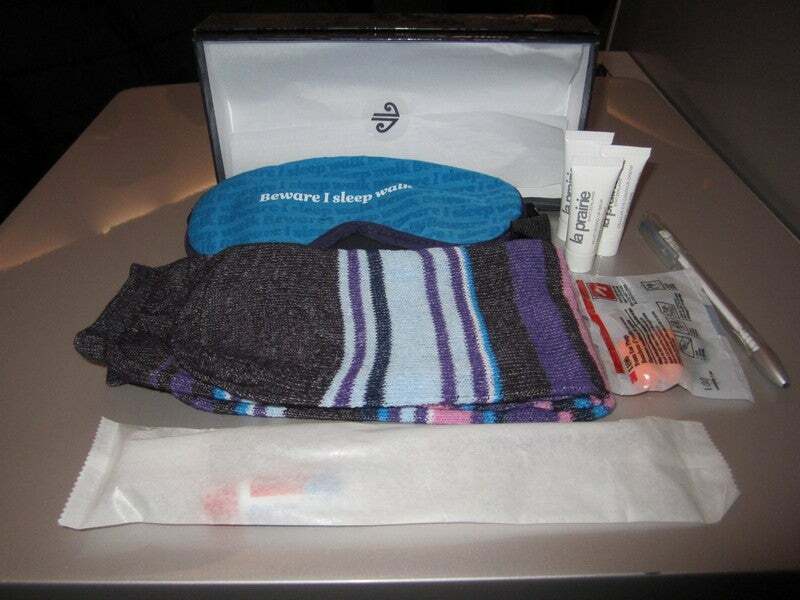 The small amenities box I was given came packed with the usual toiletries like toothbrush, tooth paste, warm socks, eyeshades, earplugs, and a pen (to fill out customs paperwork), as well as ultra-premium La Prairie eye cream, moisturizer and lip balm. The five-spice chicken appetizer along with Glenmark Riesling, Zephyr Sauvignon Blanc and Bouldevines Chardonnay. 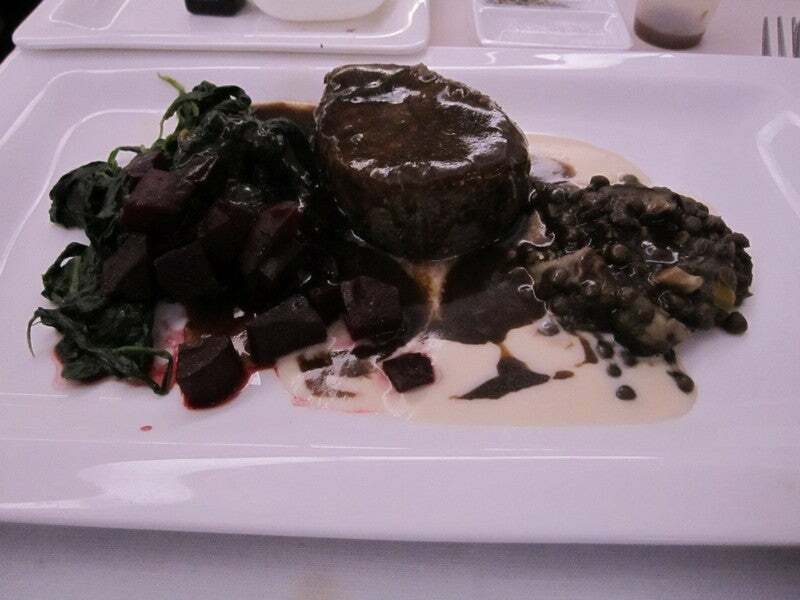 I also really like Air New Zealand’s food and wine program. The food program is overseen by three Kiwi chefs—Geoff Scott, Peter Gordon and Rex Morgan—and the menu tells you which one of them was responsible for which dish. The wine program is selected by three consultants, John Belsham and Kate Radburnd—both highly respected winemakers—and Jim Harré, who actually used to be an Air New Zealand flight attendant for over 30 years and is now one of the country’s most respected wine judges. For my dinner, I started with an appetizer of five-spiced chicken with cucumber spaghetti, daikon, papaya salsa and sesame ginger dressing, then had the seared eye fillet of beef with shiitake and lentils, beef jus, smoked beets, spinach and garlic crème sauce—both created by Geoff Scott—and a cheese plate for dessert. Since I was flying down here for the Air New Zealand Wine Awards, of course I had to try the ones they were pouring on board. All of them. So with my appetizer, I had a flight of whites including a 2004 Glenmark Riesling from Waipara, Zephyr 2009 Sauvignon Blanc from Marlborough (where I’ll be touring and tasting today! ), and Bouldevines 2009 Chardonnay also from Marlborough. Along with my meat, I sipped Wild Earth Pinot Noir from Central Otago, and a lovely Syrah from Villa Maria (one of New Zealand’s most awarded wineries) from the Hawke’s Bay region, and just a dram of Taylor’s First Reserve Port with my cheese. 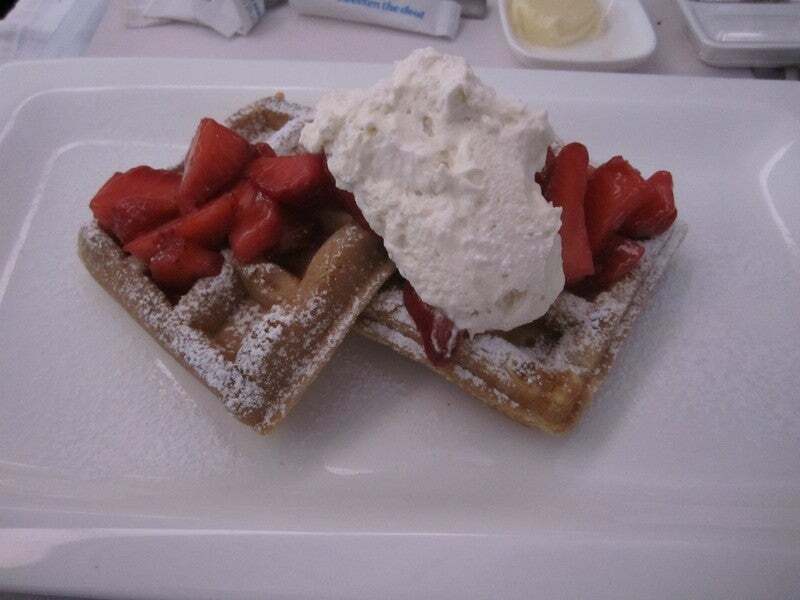 Meal service was done within 2.5 hours of departure, leaving a good 9 hours or so left in the flight to rest before breakfast service, for which I chose the waffles with fresh strawberries. I tend to avoid eggs on planes for obvious reasons (runny and yet somehow rubbery—it’s a mystery! ), which were delicious, but as soon as I saw the poached eggs with hollandaise, bacon and asparagus, I realized my mistake. I’d forgotten that these planes have new induction ovens that mean everything is cooked to order right then and there (rather than just reheated), and they can do a lot more with food like meats and eggs. Ah well, I still have my return flight! Meanwhile, I’ll be winetasting in Marlborough, seeing how the city center of Christchurch is recovering from last year’s earthquake, taking a cooking class at Otahuna Lodge and tasting the wines of the Waipara, swimming with mini dolphins in Akarao, then heading inland to glacier kayak at Mount Cook (and taste the amazing salmon there! ), flying over the Southern Alps, bungee jumping in Queenstown, biking the Otago Central Rail Trail, and making a few winery, foodie and adventure stops in between, so if you have any suggestions, let me know! Full disclosure: Eric Rosen flew Air New Zealand Business Premier as a guest of the airline, but all opinions expressed are entirely his own. Starting off with a glass of champagne…and some water. Gotta stay hydrated. The Business Premier amenities kit including all the usuals, plus super fancy la Praire spa products. The beef fillt with shiitake and lentils. 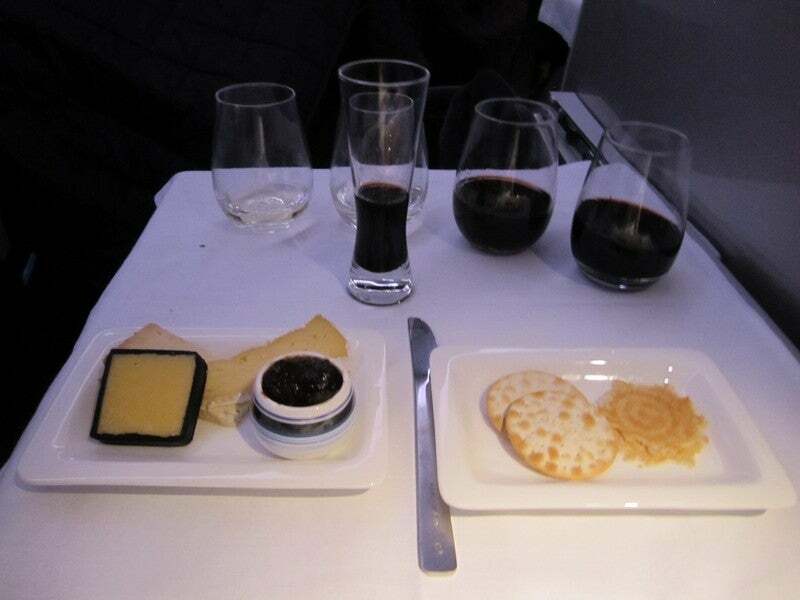 My cheese plate plus the two on-board reds: Wild Earth Pinot Noir and Villa Maria Syrah…and Taylor’s First Reserve Port. 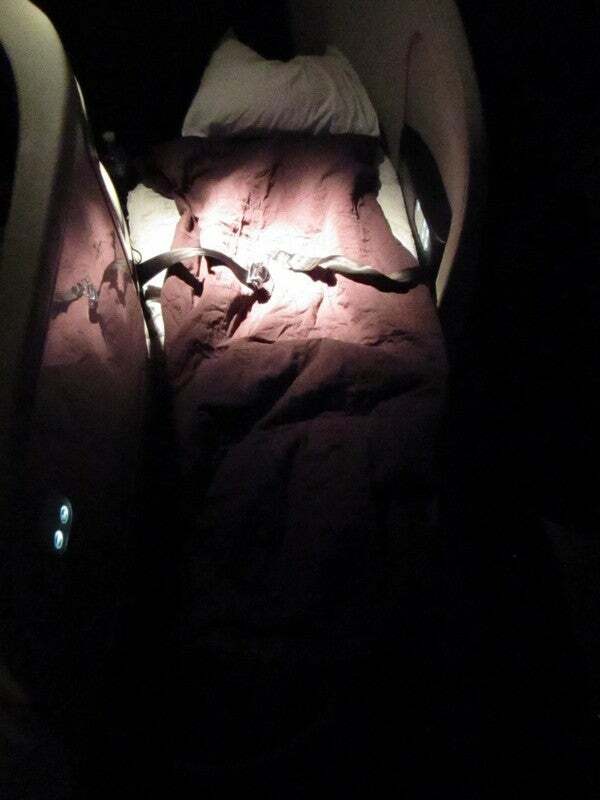 My bed reclined to its full 6’7″ flat position. Waffles with whipped cream and fresh strawberries for breakfast.